Joseph Aronov came in first at the Coaches Individual with an all-around score of 44.2. The sophomore was the star of the state meet, winning all six events and leading Newton North to second-place finish. Wang racked up an impressive 53.9 to win the all-around. His highest scores were in vault (9.4) and floor exercise (9.4). The NEC/CAL MVP came in first place in the North Sectional all-around (37.975), placing first in bars (9.600) and vault (9.475). At the State Coaches Championship, she placed second with a 36.275. Gomes was first at every conference meet. The junior helped Attleboro take the state title for the first time since 2002. He placed third in vault with a season-best score of 8.8 and was fourth in the floor exercise with a score of 8.3. Aronov came in first at the Coaches Individual with an all-around score of 44.2. He helped Andover place third at the state meet by coming in second (49.1) in the all-around. He was a medalist in every event at the state meet. 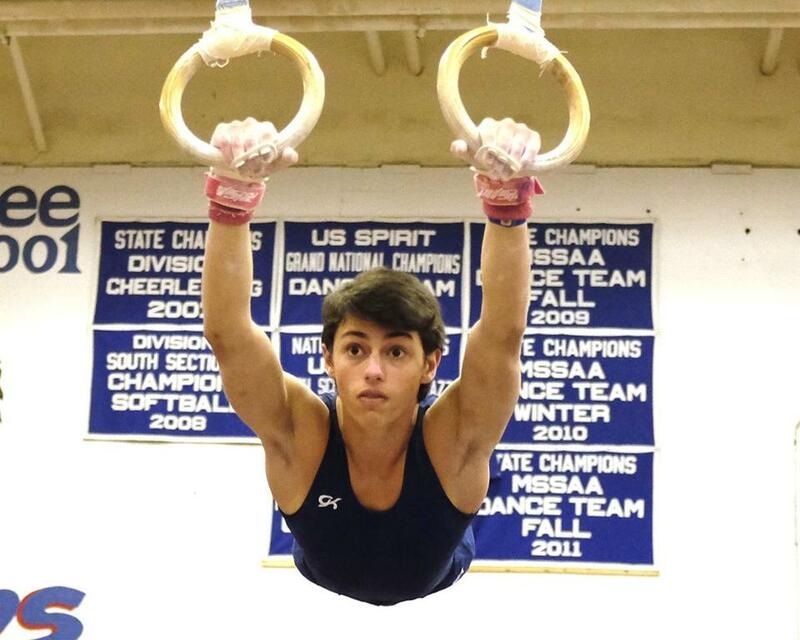 DePippo led Attleboro to its first state title in 12 years with a third-place finish in the all-around (45.6), a jump from his sixth-place finish a year ago. He came in second in parallel bars (8.1) and fourth in pommel horse (7.4). The junior helped the defending state champs take third this winter, coming in fourth in the all-around (44.2). He took second in the pommel horse (7.8) and tied for third in the high bar (7.6). Harvey also achieved a high score of 48.6 this season. Igoe placed fifth at the state meet with an all-around score of 43.2. He came in fourth in the high bar (7.5) and fifth in the floor exercise (8.3). At the Coaches Invitational he tied for first in the floor exercise (7.6). With Weiss and fellow All-Scholastic Jonathan Wang leading the way, the Tigers finished second to Attleboro. Weiss recorded a 40.9 all-around score to finish seventh. He also finished third in the still rings and third on the floor exercise. The Hockomock League MVP and All-Star led Mansfield at the South Sectional with a fifth-place finish (36.250) and an eighth-place finish at the state meet (36.125). Anastos holds the school records in all-around (37.45) and vault (9.55). The junior’s sixth-place finish (35.9) at the Coaches Individual Championship qualified her for the New England Championship, where she took first place on the balance beam (9.5). She also won beam at the South Sectionals (9.5). Carver won the floor exercise at the North Sectional with a 9.500 and placed third in the all-around (37.375). At the state meet, the junior led Andover with second-place finishes in the all-around (37.200) and the vault (9.425). Her high score for the season is a 9.65 in floor. The Middlesex League individual champion came in first at the State Coaches Championship (36.475), bettering her runn-up finish from last year. At the North Sectional DeBari led Melrose with an eighth-place finish in the all-around. For the second straight winter, Fraser led Barnstable to an undefeated season including the MIAA state championship. Fraser was fifth in the all-around at the Coaches Individuals, fourth in the South sectional and fifth at the state meet. Harrington won the bars at the Coaches Individual Championship with a 9.025. She led Wellesley to a fourth-place finish at the South Ssectional by coming in sixth in the all-around (36.200). She qualified for the Coaches Individual all four years. The Bay State all-around champ led Wellesley at the South Sectional, finishing in seventh in all-around (36.125). At the state meet, the senior finished ninth (35.600). Kelliher is also a state-qualifying diver. A repeat All-Scholastic selection, Kilmurray finished ninth in the State Coaches championships with an all-around score of 35.725. At the Cranberry League meet, she finished first in the all-around at 36.50 to earn Cranberry South All-Star honors. Andover’s team MVP finished third in the beam and seventh in all-around at the North Sectional. At the state meet, Livingston was third in the all-around (36.925) and tied for second on the vault (9.425). Stevens came in second place in the North sectional (37.450) and helped North Andover qualify for New Englands for the first time by coming in first on floor (9.450) and third on beam (9.525) at the MIAA state meet. She also broke school record on beam (9.75). The sophomore came in first in the South Sectional all-around, paced by a score of 9.725 in floor exercise. At the state meet she led Barnstable to another title, tying for sixth place in all-around and third for floor exercise (9.2). Wang came in first on the beam (9.550) and third in the all-around (36.225) at the Coaches Individual Championship. At states, she tied for sixth in the all-around (36.475), helping Newton South qualify for its first New Englands. Newton North’s newest coach stepped in this year and the Tigers didn’t skip a beat, posting a 6-0 record and a second-place finish at the state meet (175.9), less than a point behind Attleboro. He also was selected Coaches Association coach of the year. In her seventh season, Vadala led the Golden Warriors to a North Sectionals win and a runner-up finish at the state meet, breaking the school record for points in a meet three times along the way. Andover went 10-1 in dual meets to win the MVC crown. Bay State — Wellesley: Molly Harrington, Allison Kelliher. Cape Ann/Northeastern — Beverly: Heather Gomes. Cranberry — Attleboro: Ali Kleinebriel, Hayley Ricci, Alanis Tirabasi. Barnstable: Jillian Fraser, Jackie Hansen, Lauren Hansen, JoJo Leveroni, Hayley Myrbeck, Kayla Myrbeck, Tali Twomey. Bridgewater-Raynham: Bella Antonangelli, Nina Petti. Norwell: Jessie Westergard. Hanover: Lauren Galotti, Devan Martin, Kaitlyn Powers. Hingham: Casey Hynes. Marshfield: Katie Conley. Nauset: Kasey Kilmurray, Haley Roderick. Notre Dame (Hingham): Mia Cogliano, Hannah Coulter, Hayley Doyle, Kelsie Dwyer, Kristen Fahey, Liz Kenneally, S. Mondo. Dual County — Newton South: Kalena Wang. Hockomock — King Philip: Sam Boardman, Sam Dalton, Sam Magnarelli. Mansfield: Alexa Anastos, Alexis Anastos, Kelly Crawford, Marielle Fisher, Kate Moore, Lacy Whiticher. Sharon: Rachel Greene, Natalie Maidment. Merrimack Valley — Andover: Courtney Carver, Jessie Livingston. Lowell: Ryan Freker. North Andover: Nicole Stevens. Middlesex (Freedom) — Burlington: Amelia Cecere. Melrose: Rachel Ardizzoni, Annalisa DeBari, Julia Lomakin. Stoneham: Gianna Lanzillo. Middlesex (Liberty) — Arlington: Chase Currier, Clara Stewart. Winchester: Abby Langlois, Gabby Wankowicz. Woburn: Kelly Doherty.